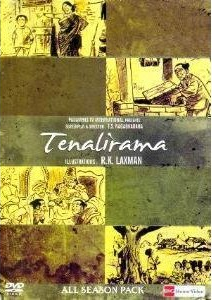 While reviewing the first episode of Hindi TV Serial Tenali Rama, we were introduced to a young boy named Rama (or RamaKrishna) from a village named Tenali, situated in Southern part of India. We saw him as an aimless, lazy and unenthusiastic kid. His mother worried a lot about him and his future. It was a day when Rama visited a temple and he got face-to-face with the Goddess. During his meeting the Goddess offered him two boons to choose from and he wisely chose his fortune! And it was the incident which made his world moving 180 degrees! Now he is intelligent, enthusiastic, clever, witty and promising kid. What happened in the temple is something for you to view, we are not going to spill the beans here, it may reduce the charm of watching it on screen otherwise. For the temple scene, while it is good at content and the message it convey, it is very poor in terms of special effects. The scene clearly convey that in order to get blessings from the God, what you need is a pure and genuine heart, no rituals or formalities are expected. The multiple heads of the Goddess look fake and fails to create any impact. Also the lady actor playing the Goddess was not convincing. Moving ahead in episode 2 let us explore the incidents happened then after. Now Rama is calm and composed kid. But he is a kid so he is mischievous as expected. One day when her mother was unable to ignite the fire due to wet wood sticks, he helps her intelligently. In this scene where Kartik is not so convincing, while the actress playing his mother (Kishori Ballal?) is fantastic. She is very natural and convincing. Now Rama cleverly ignited the fire but when asked by his mother to go to the village school he refused by saying that he doesn’t find it interesting to go to school. But as his mother insisted he leave for the school. It clearly gives a nice message (especially to the kids) that one should follow his/her parent/elder/well wisher’s advise, even if you are not very convinced; because your genuine elder advise you only what it is good for you. In the school scene we see that teacher taught some stuff to the student and then asked them to repeat the same thing and he started reading some stuff. We see that while chanting the same words teacher asked them, students were provoked by seeing a monkey! They offer the monkey the fruits. The scene is a satire to the education system and explores the child psychology very well. Teaching needs to be interactive and convincing. Just repeating what it is told to you is not learning. And a child is a child by all means, he is curious and mischievous always. It is a teacher/parents’ responsibility to guide his energy to the right track. However Rama was not part of this funny act, teacher consider him as the responsible person for this distraction for all the students. It conveys us that your prestige is based on your work done so far, and it takes time to clean your image. So always watch your actions, they are going to make your image in people’s mind. Anyway, the scene followed by scolding of Rama is really interesting to see. It is when teacher asks Rama to teach the students instead (as teaching is not simply a fun, it is a tough task and needs to be done with responsibility). Rama starts teaching the student when the teacher was away, and we found that his interactive way of teaching is found interesting by the student, and all them started learning with attention!!! This scene reminds us a very similar scene in famous film 3 Idiots (where Rancho demonstrates – how to teach?). Also the reactions of the teacher, Rama’s mother, and an elder sage are good to watch. The actor playing Rama’s teacher does excellent work and is very convincing. The stuff is filmed on simple locations but it is very effective. Though we find that the dialog delivery of Kartik (playing Rama) as the teacher is not convincing. He doesn’t seems to be natural actor. The background music during these scenes is up-to-the-mark. The incidents explored this point forward shows how Rama found a way to earn some fortune using his wit. Though the scenes are effective and explore the human behavior (and psychology) very interestingly they have some loopholes too. For example the washer-man doesn’t know about what Rama is doing with his donkey for days, despite of people from distant location started to come and meet Rama and the donkey (due to the fame of the duo) is unconvincing. If you consider it as a TV Serial for children, you can avoid looking at these loopholes and can enjoy it. Despite of some limitations and down side, the serial is good at content and convey the nice message effectively. As it spread the quality of wit, wisdom, positive attributes and ethics, one shouldn’t miss it. It is very tough to find genuine TV Serials which contain message as well, so just go for it. Do you like to buy this TV serial? What you think of Tenali Rama and his tales? Do you find them interesting? If you like this article, do not forget to share with your friends and family via Facebook, Twitter, Pinterest and other social networks.